These days, wherever you go in Amish America you’ll see signs alerting you to all those good things that come out of Amish gardens–green beans, tomatoes, strawberries, cucumbers, onions, and the like. They’re a happy excuse to pull the car over, pick up something healthy for the table, and maybe chat a bit with an Amish housewife or her children. For the families, these roadside mini-businesses are a great way to offload surplus produce and pocket a little extra coin for the household. And these handmade signs are all the advertising that need be done. They have a certain look to them–hand-lettered, and often made from what looks like a piece of scrap wood or other material. Must have been a bumper crop this season. 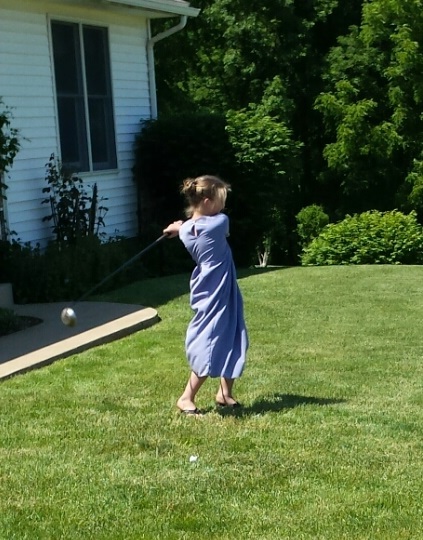 Actually, if you’re wondering, some golf does go on among Amish, though I wouldn’t call it the quintessential Amish sport. He is surprised to see this sign in Adams County, Indiana, however, which is where these photos were taken. It’s funny I know exactly where these signs are located in Adams county because I have the same pictures! There are 3 little boys who sell the used golf balls out of a large Rubbermaid tote for 25 cents each. 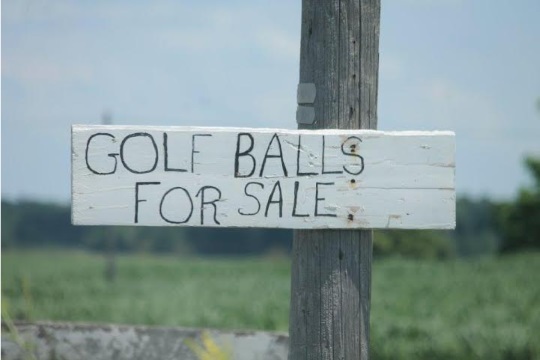 They collect them from the high school’s golf team practice field. Lancaster Host backs a lovely farm and it has a full golf course. I walk the trails behind it and talk to the cows… I would imagine that farmer gets tons of golf balls too! How neat for these young ones to be so enterprising. I too am grateful for the background on this story. Thanks, Jodi Click. Thanks again for another interesting insight. We were just musing about how few “English” children would have opportunity or motivation to have real work that contributed to their lives. We are driving to see Ed and Rurh right now! Should be in fertile, mn tomorrow by noon. Can’t wait to see them and meet our new grandson! Anne, travel safe, I am sure you will have a wonderful visit, and say hello to Ed and Ruth! Thanks Erik! I hope to get some photos and have some stories to tell when we get home. We used to live next to a golf course and would pick of the strays. We never sold too many but they got used for batting practice, and targets for .22 shooting, and just whatever else a bunch of golf balls are good for. I did forget! Thanks for reminding me. Great shot. I just added it to the post. 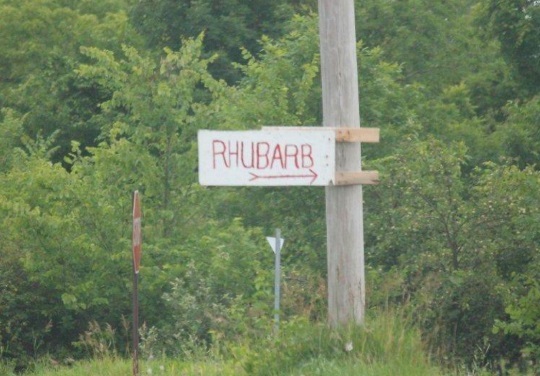 Ok the gold ball one made me LOL and I love your comment on the Rhubarb. LOL! 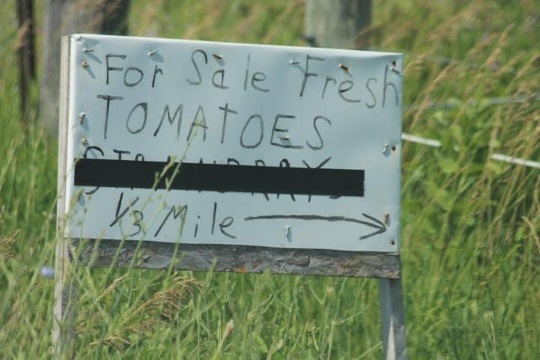 Here is a link to an Amish sign I never saw until… well until I saw it. Does anyone have an idea what it means? Ha! Being as the Amish tend to list exactly what they have to sell and not generalize, I’m assuming they are selling hoes. For the garden. Probably not the other kind. 😉 That’s a great picture and classic example of being a bit behind the times by not knowing any better than to post that! This company is not Amish. I don’t know of a local Amish concern that could fill reefers. This company has several local produce markets in season. As their name implies they do sweet corn. They have “branched out” into other crops.